In this experiential workshop you will learn about the history of Reiki, the chakra system and the energy body. 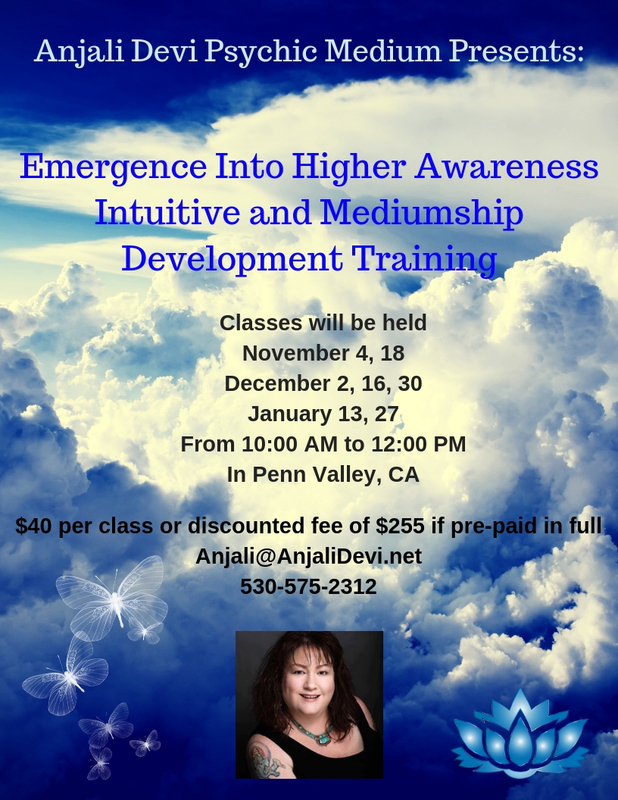 This training will include guided meditations and you will receive the Reiki attunement which allows you to permanently tap into the Reiki energy for your own healing and the healing of others. (Animals LOVE Reiki by the way) You will learn how to give yourself a Reiki treatment. Massage tables will be set up to learn and experience how to give Reiki to someone else. You’ll be surprised at other ways you can use Reiki in your day to day life. Anyone can learn to use Reiki. 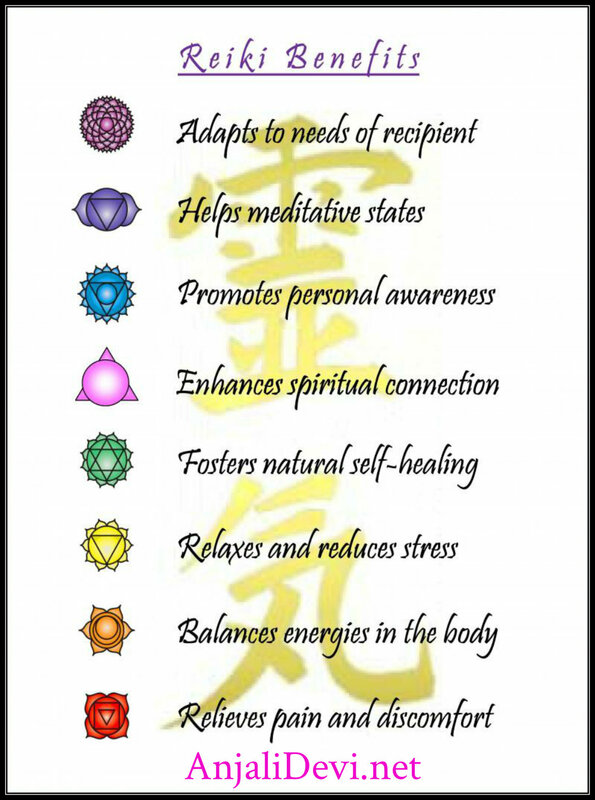 Reiki is amazingly simple and simply amazing! Be in charge of your own healing. 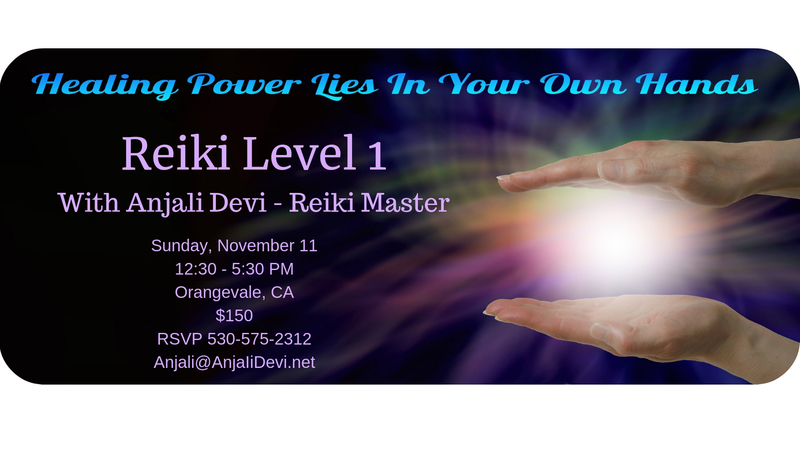 To reserve your space for this life changing workshop, email me at Anjali@AnjaliDevi.net or call 530-575-2312. Connect with your innate ability of being a multi sensory being! • Open your spiritual senses and psychic awareness including clairvoyance. • Learn meditation techniques to reach deeper levels of awareness. • Recognize your intuitive abilities. • Perceive psychic information through clairvoyance, clairaudience, clairsentience, claircognizance. • Learn to extend your perception beyond your physical body. • Learn to attune yourself to spiritual energies. • Develop and practice your ability to pick up information from objects and give readings through psychometry. • Learn to perceive the human aura. • Know the difference between psychic information and your imagination. • Learn techniques to keep from taking on other people’s moods, energies and conditions. • Give psychic readings to other workshop participants. • Receive accurate intuitive guidance for yourself. • Understand the ethics of psychic readings. • Learn to trust your intuition. Class size is limited. Contact me to reserve your space. As I sit here typing, I have a knowing. I know that there is a light surrounding each of us. A knowing that each of us came to this planet with a plan. I’ve been told that a great amount of assistance, direction and guidance went into this plan while we were in the Spirit World. We mapped out what we wished to accomplish on this earth walk. While there is always free will as a soul embodied into the physical, certain opportunities show up for growth that are in accordance with this plan. As I notice the synchronicities that occur in our daily lives, from the mundane to the the extraordinary, I can’t help but have the idea of some sort of master plan is being solidified. As some may know, the past few years I’ve been dealing with an at times, debilitating autoimmune disease. I’ve been challenged by this disease on and off since I was 21. 22 years ago I was looking for my birth mother. The disease at this time was running rampant in my body creating excruciating pain. I found my birth mother and in that momentous first conversation I asked if anyone in her family had this disease, as it’s genetic. Yes, she said. Her father had a terrible case of it. They she asked me if I had heard of Reiki, which I had not. I knew nothing about things metaphysical. She went on to tell me that she had learned Reiki to help heal my grandmother of lung cancer. It was successful. Hearing this story I honestly thought my birth mom was weird, but I was desperate for pain relief. I sought out a Reiki Master in Salt Lake City where I was living. During the first Reiki treatment, I was laying on the table not sure what to expect. With my eyes closed I very clearly saw a teenage boy standing next to me with long blond hair, blue eyes, and about 18 years old. I remember as child often seeing faces looking at me on the ceiling of my bedroom, but nothing like this. Then of all things, he started talking to me in my mind. He smiled and said that he was glad I had met his mom, and that she and I needed each other. I was pretty freaked out. The woman, who became my Reiki teacher, felt something was amiss and asked me. I told her what I was seeing and what he was saying. She burst into tears and went to the piano, bringing back a picture. It was him. It was her son who had taken his life in her house. That afternoon a proverbial light switch turned on. The message was clear. “You have incarnated with these abilities and you’re going to start using them NOW!” And so my journey began. I saw that there were lessons to be learned from having this disease. I began to actually create the space to be thankful for the pain, because without it I wouldn’t have been on a search for healing. I might not have experienced the awe and mystery of what was opening up for me. I saw that not only were there lessons, but there were blessons. It’s when you’re able to view a painful lesson as a blessing. In other words, a blesson is what happens when you see the blessing in the lesson that your challenge taught you. We all at some time or another have pain; be it physical or emotional. For me, the last few years has been a time of intense pain. My emotions have run the gamut from desperation, to finally a place of surrender and acceptance. Pain has been a powerful teacher and has taught me many lessons about myself. We can learn a lot about ourselves when we’re in pain. I want to share a few of the many blessons that pain as taught me. There are times that I have to remind myself of what I’m going to say. There are times I can’t reach for these because I’m in the so called “pit”. We can feel better when when we acknowledge that it’s there instead of trying to think positive, or by willing it away. Hello crappy day. Hello pain. Yes, you’re here. I don’t like you. I may even hate you, but this is what it is right now. Instead of cutting myself off from the present moment and pretending otherwise, I’m going to sit down and have a cup of tea with you and look you in the eye. When we try and avoid feeling something, it doesn’t leave. That anger that is stuck in your throat isn’t going anywhere unless you deal with it. That sadness that you keep throwing happy Netflix shows at, might be better dealt with by having a good cry and acknowledging that it’s there. You can’t go somewhere else and then begin to deal with your pain. You have to start right where your pain is. Pain is the ultimate teacher of patience and impermanence. It’s temporary. It’s ALL temporary. We don’t like to remember that when good stuff is going on. When we sit with our pain, it’s the best time to connect with that knowledge of impermanence. It hurts right now. There was a time when I didn’t hurt. It might not hurt tomorrow. I can be okay with the fact that right now is painful in part because, I know that ultimately it won’t last forever. Being strong isn’t about being impervious to pain. I’ll say it again another way: We aren’t strong because pain doesn’t affect us. We are strong because we let pain affect us. We feel it fully. We open up and acknowledge it. Fearlessness isn’t being a brick wall in the face of pain. Fearlessness and strength isn’t a calm facade that doesn’t allow pain to touch us. It’s the opposite. Our strength is in our raw, broken up reality. Don’t push it away. Don’t look away from it. Listen to it. You are so much stronger than you know! In the words of Sandra Ingerman, “Shamanism is the path of direct revelation”. The days of needing to go outside of ourselves for connection to Spirit, guidance, information and support are ending. The shamanic journey is a way to visit the multi-dimensional space of the Spirit World and connect with spirit helpers who are ambassadors of Spirit. Spirit helpers can take the form of an animal or a human. They are not our projections and are not our imaginations. They are independent beings who are in service to the highest Light. Their service is to help us on our earth walk. They want a warm, friendship type of bond with us. Sometimes spirit helpers are held in awe and reverence which keeps them at arms length. This places them on a different page than they wish to be. Honor and respect, yes. Learning about helpers’ communication styles is about getting to know the helpers and who they are. Spirit helpers are understanding, compassionate, warm and caring. They are never disparaging, bossy or manipulative. They will never override one’s own free will. If in a journey some thing is disparaging or looking down on us it’s either our own projection or the helper might be showing that we might be doing that to ourselves. We’re used to interacting with human beings and can project those experiences onto the helpers. Spirit helpers can be very affectionate. Bear might lovingly embrace us. Panther might lick our faces. If we hold them in too much awe and reverence we might miss these kinds of interactions. It’s important to approach the journey and the helper from a clear and neutral space. If our stuff in our mind is too strong and opinionated that can get in the way of communication with them. If that stuff is in the mix too strongly, the helpers aren’t going to impose their counsel or wisdom or be over bearing. It’s different than going to a friend to ask advice and feedback. They’ll never push their advice on us and will never be persuasive. They’ll offer us a full picture of a situation or question, including all the gray areas, and will make recommendations. Being open and receptive is crucial for successful communication with your helpers. Relationships with helper spirits is a partnership. It’s about working cooperatively. It’s not always about “I want to journey about this or that”. I talk about setting the intention before journeying. “I am journeying to the lower world to meet my power animal.” Once that is set, switch to making an invitation. If we have a new neighbor move in we wouldn’t approach them immediately asking for things. It would me more along the lines of wanting to get to know them; perhaps asking them over for dinner and hanging out. Be open to just hanging out with your helpers. Sometimes journeys will be really profound. Other times you’ll find yourself doing things that allow you to be close to helpers; getting to know them and their communication style and how the different helpers function. Writing down your journey, reflecting and reviewing the counsel is a powerful tool. Start anywhere when writing. Start at the end of the journey and go backward if needed. Going back and reading what you’ve written at other times in the day will allow helpers to know you’re integrating and help with that. Helpers won’t put in a lot of new information in journeys unless they know you’re really getting what they’re saying. You can experience more information if your commit to taking notes. If a person is having difficulty experiencing a journey, perhaps they are too passive. There’s a need for engagement on our part. This can be using your imagination to get things going. There’s a need for momentum. Use a motor boat as an example. The motor moves the boat and we can allow the helpers to steer the tiller as far as getting you to the best place that will be the most helpful. It’s not about just standing there. If you have seen any role playing video games such as Skyrim, in the beginning of a scene your avatar is in a room or vista. It’s up to the person with the control to make the character move and explore what’s there. At times just standing there waiting for something to happen isn’t conducive to a successful journey if you’re having trouble getting going. Prior to journeying you can envision the warmth and caring of your helpers. Bring that to mind before beginning. If there’s a specific place you usually meet your helper such as a beach, you can envision going to that place and then the imaginative workings can morph into a solid journey experience. Sometimes energy is needed on our side to make connection and stimulate the journey. It’s not difficult to know when things have switched from envisioning in to a formal journey. Spirit helpers offer perspective – not so much to do this or don’t do that. Great questions for spirit helpers are: “What am I overlooking?” or “What am I not seeing?” That’s the helper’s language. Sometimes what we think a problem is, really isn’t. It can be something deeper. The helper will paint a large picture showing us a different perspective. Then we can see for ourselves what to do. Relax and watch. This is the helpers preferred way of addressing things. When the helper won’t answer a question we may not be in a neutral and receptive mindset. Sometimes the question is so complex it can’t be addressed in one journey. Timing is important. The answer might be yes, but not this year. At times we may not be open to the gray areas – we want black and white. Try not to force clear answers as we expect them when communicating with a human. Everyone experiences journeys in a different way. The conversations in a journey are two way, so interact with your helper. Spirit helpers honor privacy and won’t give information about someone else. They won’t share about another person unless it’s directed toward us and how we’re functioning in a relationship. Remember that helpers are about healing, growth, forward movement, healing, support and nourishing. They want to help us in all areas of our lives and await your connection with them. Getting to know them takes time as with any friendship. Taking the time to do this can be a rewarding and powerful addition to your life. I LOVE teaching this workshop and witnessing the changes in my students from the beginning of class to the end. The light that goes on is visible in their eyes and on their faces. 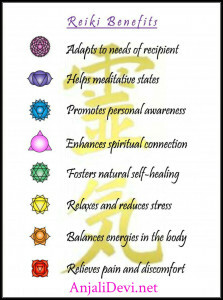 Reiki is a way of being in charge of your own healing. Even though I offer many different healing modalities, my Reiki lineage is traditional Usui. 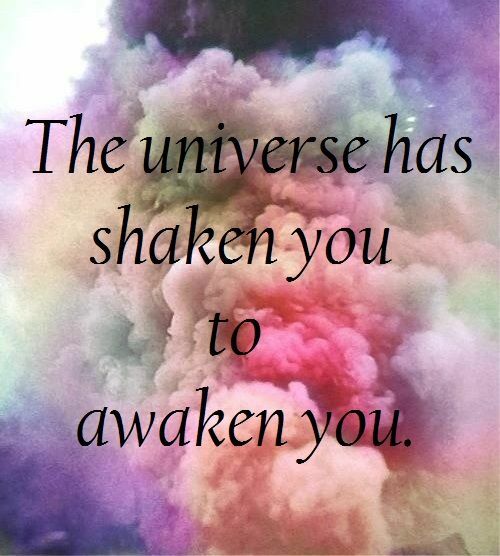 Spiritual Awakening – Are You Feeling It? There is a great awakening happening on this planet. The momentum behind this is getting stronger. This is an awakening to your inner knowledge. A knowledge that goes beyond what you’ve been taught. It’s the knowledge of Self. A knowing that the physical is just a part of the spectrum. When this begins with you, it’s important to believe it, work to understand it and know it. In the beginning it can feel quite confusing. People you know and might have had things in common with, may seem on a totally different wavelength. Those of you who have gone through this or are beginning are the forerunners; anchoring the higher frequencies and grounding them for others. There can be physical changes that a person might be feeling. Unexplained body pain, depression, anxiety and insomnia are a few. Our bodies are adjusting to the new energies coming though it. We need to take extra care of our bodies. Eating well and exercising. Love yourself and your body. Talk to your body; love and nurture it. Get plenty of rest, slow down your pace and connect with nature. Get together with people of your kind. This is really very important as one can feel quite alone going through this process without anyone to talk to about it. Meditate to expand your consciousness. Embracing these energies and working on self healing is a way to help the entire world. We are One and all are connected because of this. What you do personally affects the Whole. Can you imagine what this planet would be like if everyone worked their stuff? The Emergence healing work that I do is of great benefit for those who are awakening. It helps clear out the lower vibrational emotions that no longer serve you, making room for more Light. Light is information. Receiving Reiki attunements and having the ability to also work on yourself is also really positive. If you’d like more information about the Emergence work that I do, you can contact me through my website or send an email to Anjali@AnjaliDevi.net. I offer a free 15 minute phone call to talk about my work. So ready or not, the winds of change are indeed blowing! Are you feeling it? I sure am! Eclipses bring the unexpected, forcing us into action and taking us into new, unchartered terrain. Repeat after me; change can be a good thing! Procrastination is part of the human condition. We avoid what’s painful and stay in our comfort zones. That’s why we occasionally need a little cosmic kick in the pants to push us off the fence and into action. Eclipses are these agents of change. They fall four-to-six times a year and turn things as we know it upside-down. In this disoriented state, we may act out of character or see turbulence in the world. 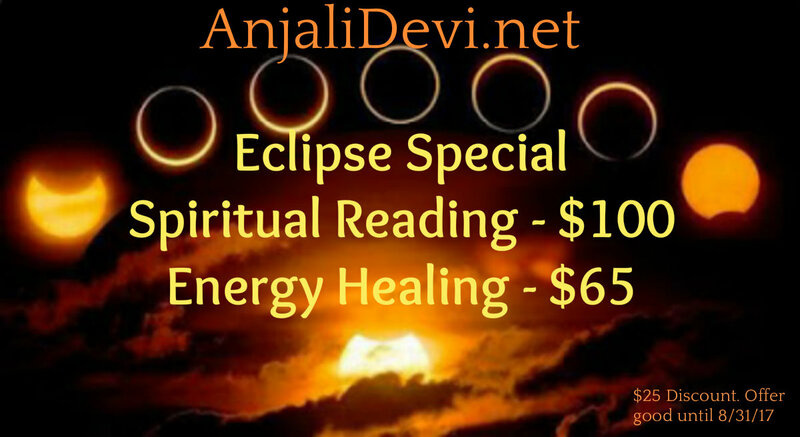 Eclipses can also help break patterns and shift dynamics. Our big solar eclipse is August 21. Spiritual Readings offer a glimpse of the information and energy the you’re working with in present time; to either bring in or to release, creating space for you to move forward with less effort on their personal life path. Energy work assists in releasing that which no longer serves you, making room for more that does! We can’t fill up with the new and awesome if we’re attached to and carrying around old information and stories in our energy bodies. I’m offering an Eclipse Special to help you through. Four legs, feathers or fins; all creatures have an energy body as well as a physical one. Like humans, animals also have a chakra system. Chakras are wheels of energy throughout the energy body. Chakras correspond to bundles of nerves and major organs. There are seven main chakras which align with the spine and go from the base of the spine to the crown of the head. Invisible energy called prana or life force energy flows through these chakras which keeps up vibrant, healthy and alive. If there is a blockage the energy can’t flow and the result can be health issues. Think of something as simple as your bathtub drain. If you allow too much hair to go into the drain, the bathtub will back up with water, stagnate and eventually bacteria and mold will grow. The healing work that I do is very effective on animals as well as humans and my practice has been including more animals lately. Last week I was called upon to work on a small dog who had ingested something poisonous. She was at the vet spending the night on IV to flush the liver of whatever the toxin was. Reiki energy healing can be sent from a distance. I don’t have to be physically present to work with a client. The first time I sent the Reiki I could feel the dog’s life force energy was very low. I had the strong visual impression of the kennel she was in and how afraid she was. I wasn’t sure she was going to survive. Two hours later I sent healing again and this time I felt a noticeable shift in her energy and the amount of Reiki that was flowing from me to her. She felt stronger and I got the sense she was going to pull through. The next morning her mom sent me an awesome picture of a happy and perky looking pup. Recently a client asked me to work on her dog who had a complication from his neutering procedure. He had a blood clot and he was extremely swollen and in pain. The vet told her this was a dangerous situation. She brought him to me. I told her that it was my experience that dogs will lay still for about 15 minutes and then be done. I placed a blanket on the floor and laid down next to him supporting his leg so I could hover my hands over the affected area. He immediately relaxed and seemed grateful to be in a position where nothing was putting any pressure on the affected area. Like clockwork at exactly 15 minutes he stood up and was done. The next day he was so much better he didn’t need any further surgical assistance. My favorite example of Reiki healing and animals is about a horse named Cowboy. Years ago I had two horses and Cowboy was kept at the barn where mine were. He was a champion halter horse, which meant his conformation and beauty was exceptional. He had sustained an injury to his face and damaged the nerves leaving his mouth drooping in a substantial manner. He was no longer able to be shown. One evening I came home from working my horses to make dinner for my family. Once home, I had the overwhelming feeling that I needed to get back to the barn because something was very wrong. My daughter got into the truck with me and back we went. When I got there I saw that all the horses in one paddock were covered with blood. I saw that Cowboy had gotten kicked and a major artery in his leg was cut. His large heart was pumping the blood out of this artery yards at a time spraying all the other horses. I dropped to my knees and placed pressure with my hands on the injury to compress and stop the bleeding. My daughter ran to get the barn owner to call the vet. He would have bled out as feeding time wasn’t for several hours. The vet came and stitched him up. Cowboy’s owner was out of town. Each day when I was done with my horses I would go into the stall with Cowboy to place my hands on his leg and give him Reiki. I did this for about two weeks. I happened to be at the barn when Cowboy’s owner came to see him. The first words out of her mouth were, “Oh my God, his face is fixed!” Sure enough, when I looked at him, his mouth was back to normal. The severe drooping of his lower lip was gone. She has spend thousands of dollars on modalities such as acupuncture trying to get her boy back in the show ring. The healing I had given his leg also repaired the damaged nerves in his face. 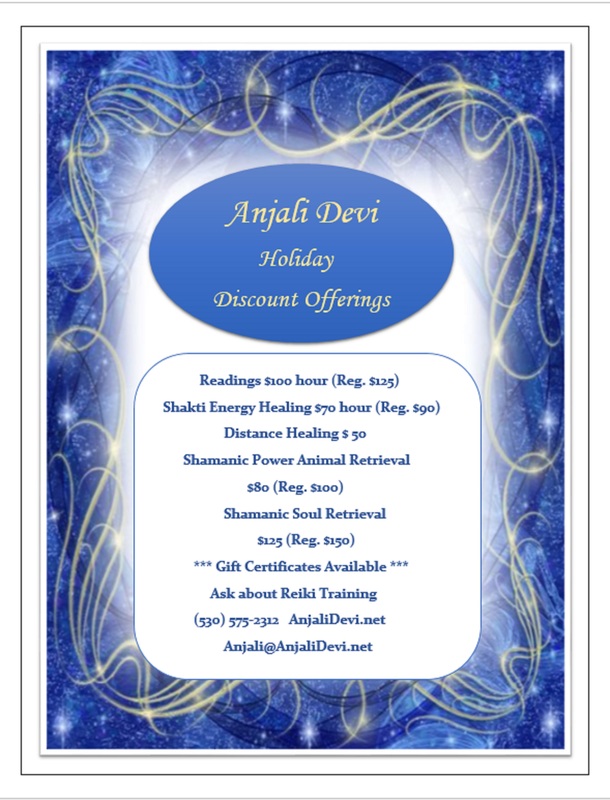 These are just a few examples of Reiki energy healing with animals. I have worked on dogs, cats, parrots, horses and even chickens. If you have an animal in need I can work at a distance, in my office if possible or I can travel within reason.